The history of scientific, technical and medical exchange between Europe and China during the early modern period (16th to 19th centuries) is an important topic of research undertaken on a global level, but so far, much attention has been paid to special fields like astronomy, mathematics and cartography while other fields of practice and knowledge remain understudied. The targets of this event will be to share between colleagues mainly from China and Germany experiences obtained from relevant research and delineate fields of promising investigations. 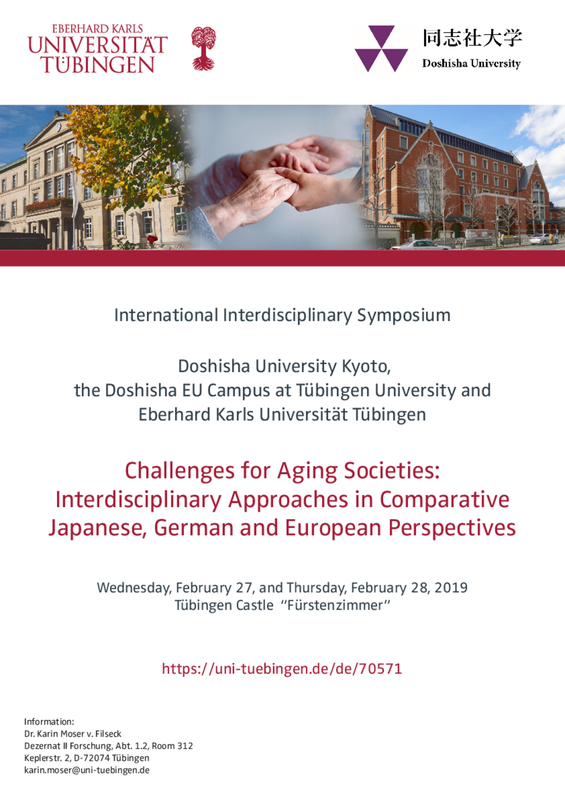 With the international interdisciplinary symposium “Challenges for Aging Societies: Interdisciplinary Approaches in Comparative Japanese, German and European Perspectives” on 27-28 February 2019 the “Doshisha EU Campus at Tübingen University” will officially start its activities this year. Prof. Dr. Gregory Poole, Vice-President for International Affairs at Dōshisha University, and a delegation of seven researchers and administrative staff members from Dōshisha University will join the Tübingen conference. Taiwanese businessmen’s investment into China and technology transfer have played a key role in boosting the Chinese economy since China’s economic reform, though interflows as such also witnessed Taiwan’s increasing economic dependency on mainland China amid unresolved political fractions. This lecture introduces how an anthropological approach can provide alternative perspectives on the issue aside from the economic data. 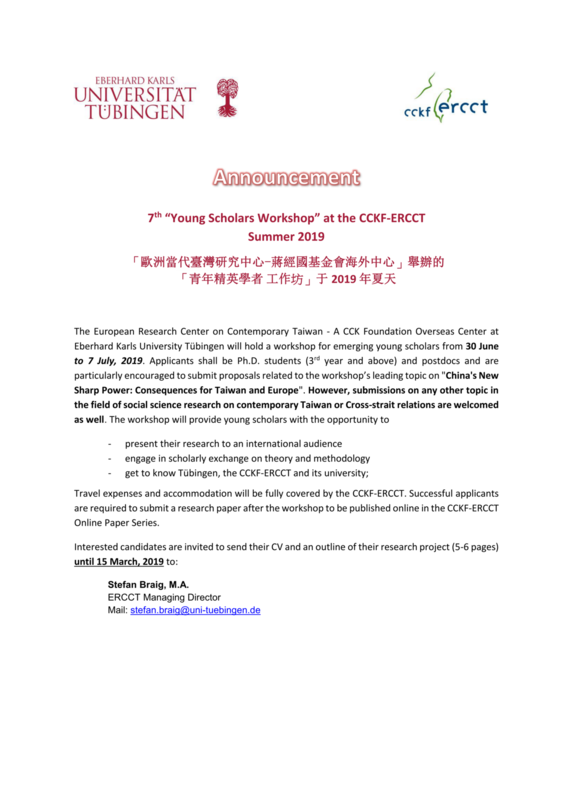 Die Fortführung und Finanzierung des European Research Center on Contemporary Taiwan (ERCCT) als Overseas Center der taiwanischen Chiang Ching-kuo Foundation for Internatianal Scholarly Exchange für die nächsten fünf Jahre ist beschlossen. Diese Nachricht von CCKF –Präsident Chu Yun-han erreichte ERCCT Direktor, Prof. Gunter Schubert, zu Jahresbegin. Dies ermöglicht es dem ERCCT, weiterhin für die Förderung des akademischen Nachwuchses der europäischen Taiwanforschung zu wirken und zum wissenschaftlichen Austausch zwischen Europa und Taiwan beizutragen. 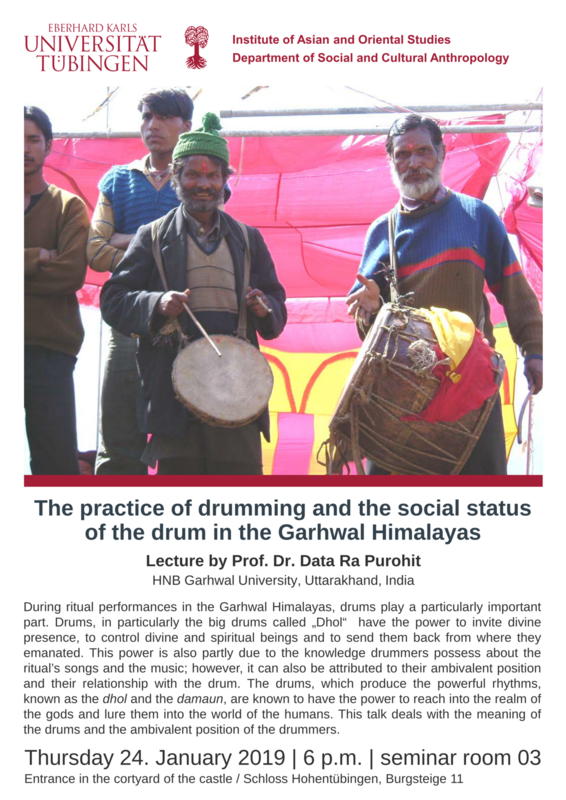 During ritual performances in the Garhwal Himalayas, drums play a particularly important part. Drums, in particularly the big drums called „Dhol“ have the power to invite divine presence, to control divine and spiritual beings and to send them back from where they emanated. This power is also partly due to the knowledge drummers possess about the ritual’s songs and the music; however, it can also be attributed to their ambivalent position and their relationship with the drum. This talk deals with the meaning of the drums and the ambivalent position of the drummers. The lecture reflects on the concepts of heritage, history and memory through investigating three urban scenarios in Hengchun [...]. Through collecting and reflecting on the narratives from Hengchuners of different generations viewing their town through different objectives, the lecture attempts to explore the various connotations of colonial heritage in Hengchun in the contemporary era and hence its meaning to Taiwan.